Like sausage rolls? 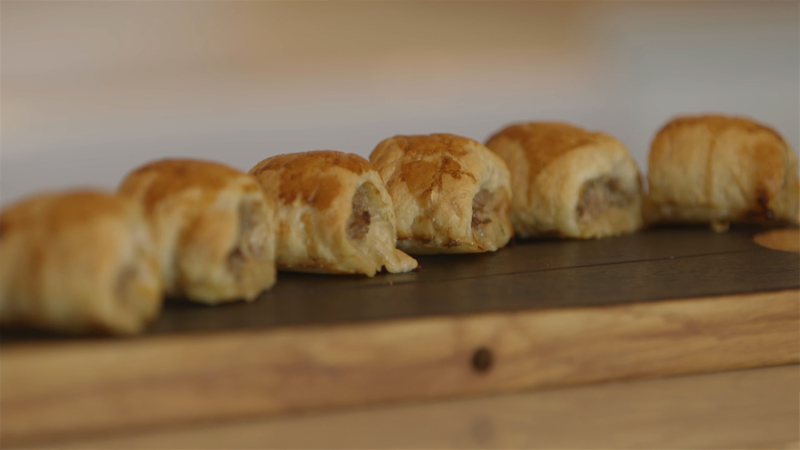 How about a muskrat sausage roll!? Dan makes a rather simple yet very tasty dish with a not so common meat. The next time you and your friends gather to watch the football match give them these to munch on. That will truly be the play of the day! • Add mustard, salt, worcestershire sauce, parsley, tobasco, brandy and nutmeg to ground muskrat. • Roll puff pastry until its approximately 4 inches wide and a foot long. Either roll meat into long cylinder or use a piping bag to pipe down one side of the full length of the pastry. Egg wash exposed pastry and roll up until fully enclosed. Place on a chopping board, eggwash and freeze – the whole chopping board. • Once completely frozen remove and as it defrosts cut into 1 inch long pieces. Once fully defrosted place into a pre-heated 400 degree oven and cook untll golden and cooked through, approximately 10 minutes. • Allow to cool slightly and serve.